This is not meant to be just a philosophical question, but a very practical one. What you believe moves the market affects how you make your investment decisions. Realizing that you don’t know the answer can be more valuable than thinking with certainty that you do know. Let’s explore some answers together in the context of the market’s longer term trend. 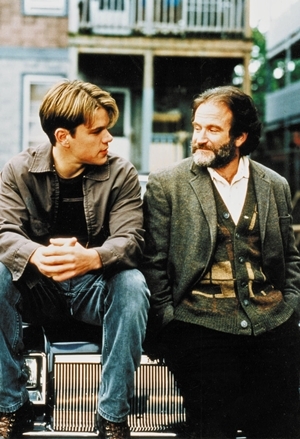 Before we begin, there are a few important lessons from a scene in the movie, Good Will Hunting. In one of the great scenes from the movie, Good Will Hunting, Will challenges a freshman graduate student, Clark, who is out to embarrass Will’s friend, Charlie, who is just trying to chat up a couple of girls at the bar. Will: Of course that’s your contention. You’re a first year grad student. You just got finished reading some Marxian historian, Pete Garrison probably, you’re gonna be convinced of that until next month when you get to James Lemon, then you’re gonna be talking about how the economies of Virginia and Pennsylvania were entrepreneurial and capitalist back in 1740. That’s gonna last you until next year. You’re gonna be in here regurgitating Gordon Wood, talking about the pre-revolutionary utopia and the capital-forming effects of military mobilization. Will: …Wood drastically underestimates the impact of social distinctions predicated upon wealth, especially inherited wealth? You got that from Vickers, Work in Essex County, page-98, right? Yeah I read that too. Were you gonna plagiarize the whole thing for us? You have any thoughts of your own on this matter? Or is that your thing, you come into a bar, you read some obscure passage and then you pawn it off as your own idea just to impress some girls? Embarrass my friend? See the sad thing about a guy like you is in 50 years you’re gonna start doing some thinking on your own, and you’re gonna come up with the fact that there are two certainties in life: one, don’t do that! And two, you dropped a hundred and fifty grand on an education you coulda got for a dollar fifty in late charges at the Public Library. Clark: Yeah, but I will have a degree, and you’ll be serving my kids fries at a drive-thru on our way to a skiing trip. Will: Yeah, well maybe. But at least I won’t be unoriginal! Clark regurgitated ideas he was taught. After all, it takes much more time and effort to assimilate, comprehend, and eventually expand upon what has been learned. It can take a lifetime developing one’s own thoughts on the matter, of not becoming “unoriginal”. J.M. Hurst majored in physics and mathematics. An aerospace engineer by training, Hurst worked on military projects during World War II including radar and antisubmarine projects, extracting information from time-series data (signal processing). 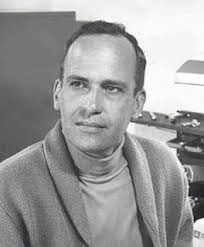 Hurst later applied his knowledge to the financial markets, and published several books and articles in the early 1970s including Theory of Irrational Decision Processes. Hurst argued that price movement is caused by decisions which are driven by motivations1. He segmented and quantified motivations into three major categories. Cyclicality and seasonality are two entirely different concepts. 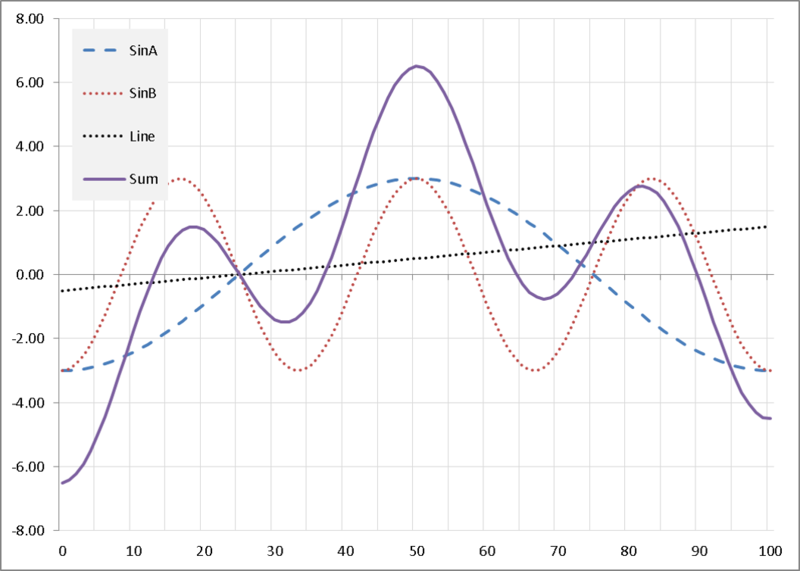 Cyclical analysis examines the periodic oscillations simultaneously present in the financial markets as illustrated in figure-3. It typically draws upon techniques and mathematics prevalent in signal processing. Seasonality studies the effect of calendar seasons on market returns, for instance “sell in May and go away”. Hurst was not alone in his conclusions that fundamental events do not explain much of the market price behavior. Many research studies by financial professionals confirm that fundamental factors are only part of the explanation. Studies vary in the degree of their conclusions due in part to differences in their assumptions and methodology. Their research methodology concluded that, “Over long periods, market prices reflect fundamentals. There are certainly periods when technical factors have a sizable effect on market prices. Additionally, instances occur in which the expectations for the fundamentals become absurd.” Some might argue that fundamental absurdity is perhaps more likely attributable to technical factors. Still, their data at times attributes some 20-30% of market price movement in the S&P 500 Index to technical effects. During the beginning years of my financial career, I studied and applied only fundamental analysis. I soon sensed other forces acting on market prices which were not explained by the fundamentals. This is when my quest began into the question of what really moves the markets. I believe what physically moves market prices in all degrees of trend is a very common force in nature – a differential in pressure. Specifically, it is a difference in pressure between buying and selling activity. But the real question here is what accounts for this difference in pressure? I believe that fundamentals such as the level, quality, and growth rate of sales and earnings explain a significant portion of the market’s long term price trend. But much is left unexplained by fundamentals. Recent work on behavioral finance supports the notion that investors do not have perfect information, nor do they always act rationally. In my experience, these technical explanatory factors are too significant to be ignored. At Coherent, we continually explore, study, and implement diversified methods of analysis without prejudice, provided they have a reasonable and rational basis. We endeavor to be…not unoriginal. The Profit Magic of Stock Transaction Timing, by J.M. Hurst, 1970, Prentice Hall, Inc. Quotes from pages 30, 31, and 203.